Since 2003, obstetrician Alice Rothchild has traveled annually to Israel/Palestine with other concerned Americans, to learn about health and human rights situation of politically marginalized communities, especially Palestinians. Condition Critical presents key blog posts and analytical essays that explore everyday life in Israel, East Jerusalem, the West Bank, and Gaza up close and with searing honesty. These eyewitness reports and intimate stories depict the critical condition of a region suffering from decades-old wounds of colonization and occupation. 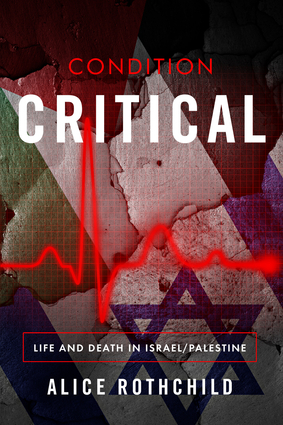 Condition Critical dares (and inspires) its readers to examine the painful consequences of Zionism and Israeli expansion and to bend the arc of the moral universe towards justice. Alice Rothchild is a Boston-based physician, author, activist, and filmmaker. Recently retired from clinical medicine, she previously held the position of Assistant Professor of Obstetrics, Gynecology and Reproductive Biology in the Faculty of Medicine at Harvard University. She has written and lectured extensively on many topics including the health and human rights effects of the Israeli occupation of Palestine. Her previous publications include: On the Brink: Israel and Palestine on the Eve of the 2014 Gaza Invasion; Broken Promises, Broken Dreams: Stories of Jewish and Palestinian Trauma and Resilience, and the documentary film, Voices Across the Divide. She also contributed to the anthology Extraordinary Rendition: (American) Writers on Palestine.